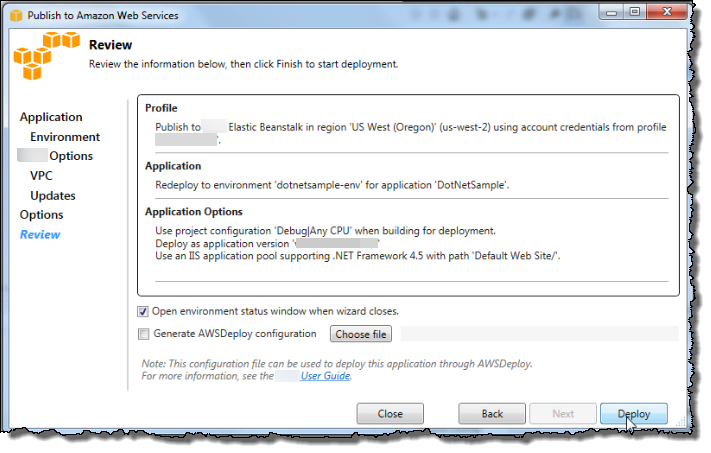 In this tutorial, you will learn how to deploy a .NET sample application to AWS Elastic Beanstalk using the AWS Toolkit for Visual Studio. This tutorial uses a sample ASP.NET Web application that you can download here. It also uses the Toolkit for Visual Studio and was tested using Visual Studio Professional 2012. First, use the Create New Application wizard in the Elastic Beanstalk console to create the application environment. For Platform, choose .NET. When the environmentis up and running, add an Amazon RDS database instance that the application uses to store data. For DB engine, choose sqlserver-ex. On the Database configuration card, choose Modify. Choose a DB engine, and enter a user name and password. 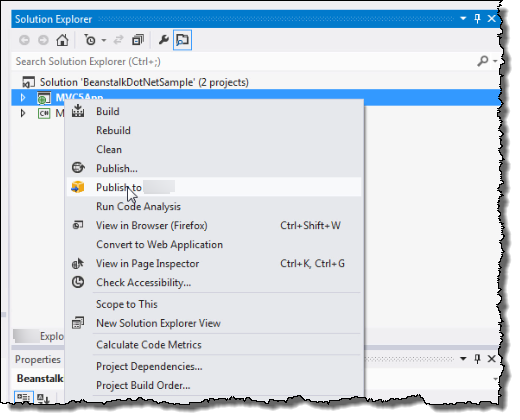 Use the AWS Toolkit for Visual Studio to publish your application to Elastic Beanstalk. Ensure that your environment launched successfully by checking the Health status in the Elastic Beanstalk console. It should be Green. In Visual Studio, open BeanstalkDotNetSample.sln. If you haven't done so already, you can get the sample here. On the View menu, choose Solution Explorer. Expand Solution ‘BeanstalkDotNetSample’ (2 projects). Open the context (right-click) menu for MVC5App, and then choose Publish to AWS. On the Publish to AWS Elastic Beanstalk page, for Deployment Target, choose the environment that you just created, and then choose Next. On the Application Options page, accept all of the defaults, and then choose Next. On the Review page, choose Deploy. 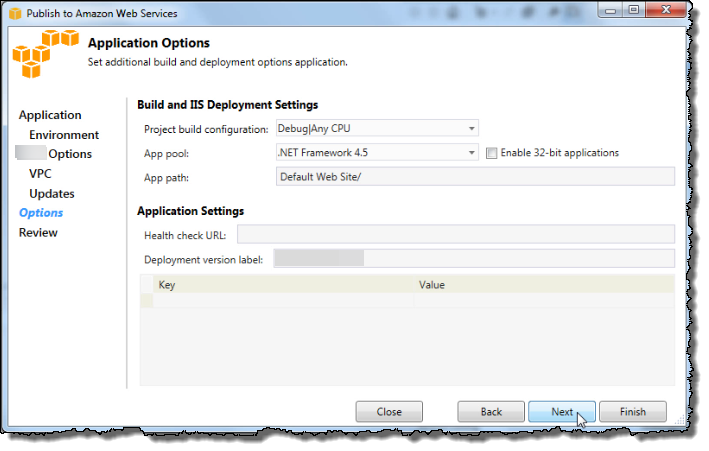 If you want to monitor deployment status, use the NuGet Package Manager in Visual Studio. When the application has successfully been deployed, the Output box displays completed successfully. Return to the Elastic Beanstalk console and choose the name of the application, which appears next to the environment name. Your ASP.NET application opens in a new tab. 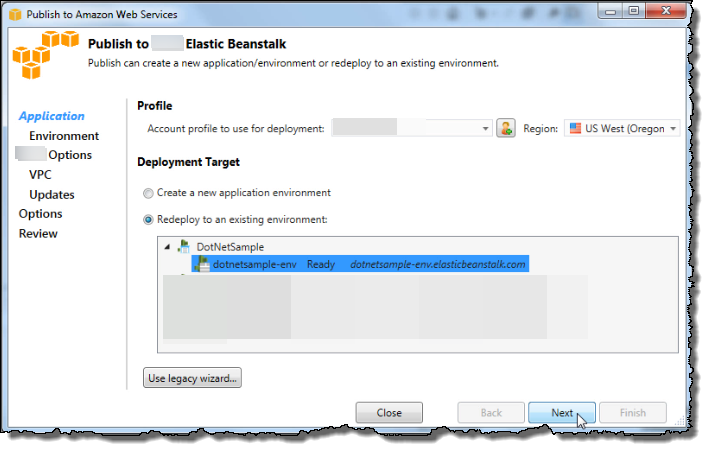 After your application has deployed successfully, learn more about Elastic Beanstalk by watching the video in the application. If you are done working with Elastic Beanstalk for now, you can terminate your .NET environment. Choose Actions and then choose Terminate Environment. 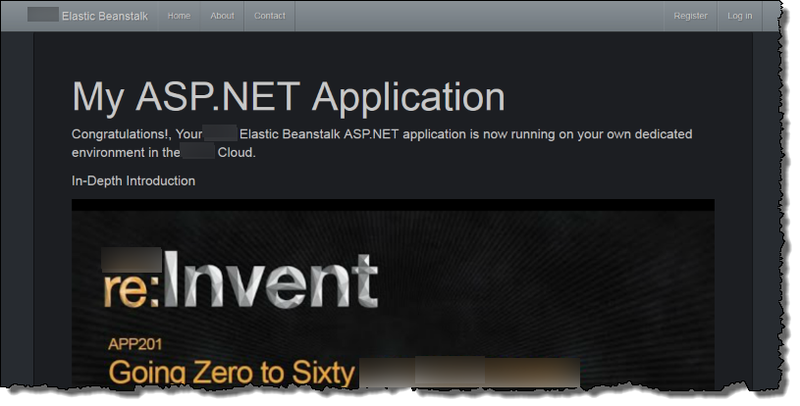 For more information, see Creating and Deploying Elastic Beanstalk Applications in .NET Using AWS Toolkit for Visual Studio, the AWS .NET Development Blog , or the AWS Application Management Blog.